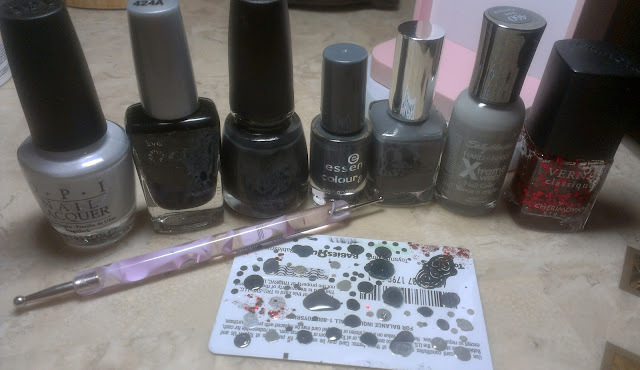 Today we have a Fifty Shades of Grey inspired mani, Maria and I are obsessed with the books, we talk about them and quote Mr. Grey and Anastasia constantly, so we decided to do a theme mani! We decided to keep it simple... 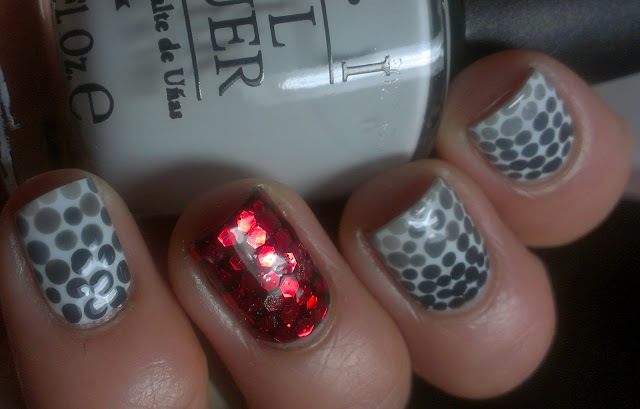 I made 50 dots on each nail .... buahhaa just kidding :-P or am I?? Anyways, hope you all have a good and safe weekend. Don't forget to stop by my twin's page @ Nails Made Simple and check out her mani. Wow, I love the accent nail. Love this mani! 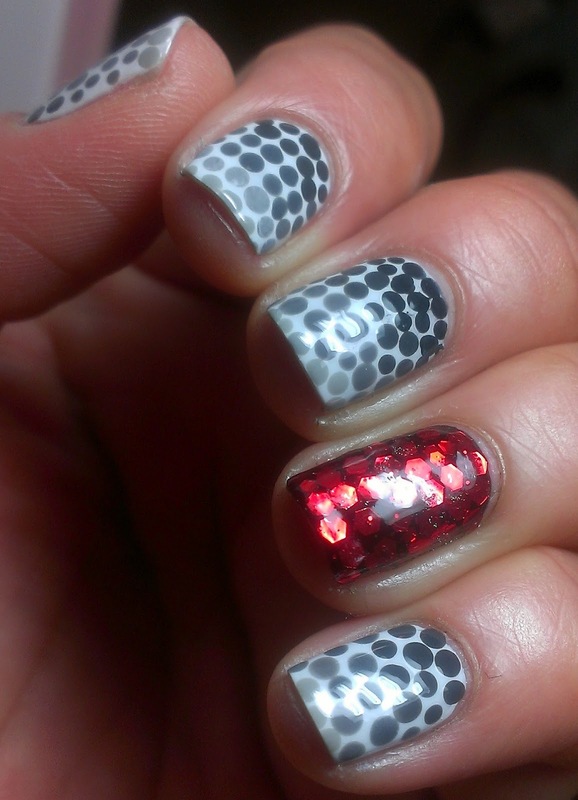 OMG I LOVE this mani! It's absolutely gorgeous. Dude this is really awesome! Who knew there were that many greys out there? hhahaa i love them bff! your nails are so perfectly squared! did you use your Blackberry to write this??? Remember always use your Blackberry .. and you better not be rolling your eyes! You girls are cracking me up!! i guess i need to read these books.. everyone is talking about them.. lolol. 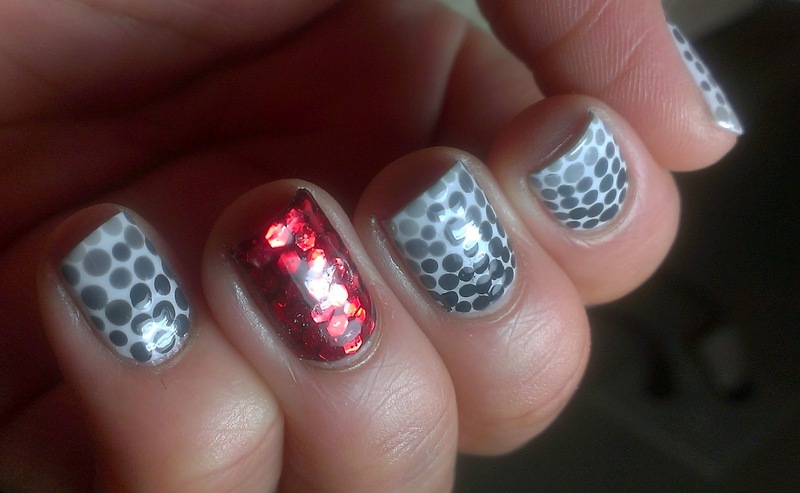 This is great, love the red nail amid the grey! This is fantastic! Looks so amazing! Hahaha! This is awesome! I loved those books, couldn't put them down! 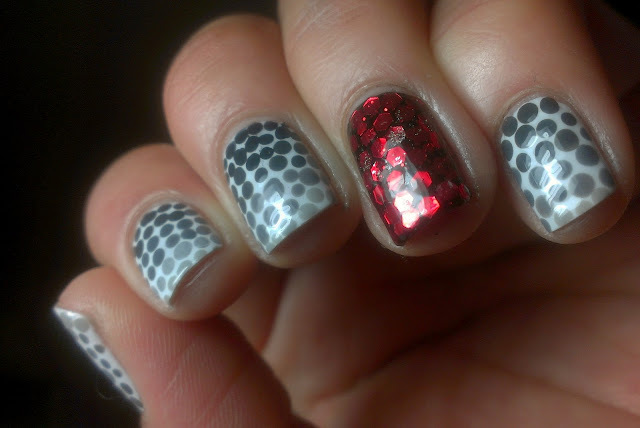 This mani looks so good, and the red room of pain nail is gorgeous! Ooh, that was the best one!! Beautiful mani! I really love the accent nail! I love the grey on white and the awesome red accent nails. Just wondering, did you arrange the red glitters to the way it is? I love the red glitter! Gorgeous, gorgeous, gorgeous!! You have fantastic work. Also liked the name of your blog has a very strong word :) and I know what it means because it is written in my native language. Any day I create a new blog. But this time on nails because I love and I'm very tempted. So gorgeous Iris! That ring finger is delicious! Absolutely love this, Iris!! You and Maria crack me up! I love both your manis!